NASA's Mars Exploration Rover Opportunity has found a rock that apparently is another meteorite. Dubbed "Shelter Island," the meteorite is about 18.5 inches (47 centimeters) long. NASA?s intrepid Mars rover Opportunity has found yet anothermeteorite on the surface of the red planet. Opportunity stumbled upon this new meteorite, dubbed"Shelter Island," less than three weeks after driving away from alarger meteorite that therover examined for six weeks. The rover began its approach to the meteorite with a 92-foot(28-meter) backwards drive on Oct. 1, the rover's 2,022nd day on Mars. 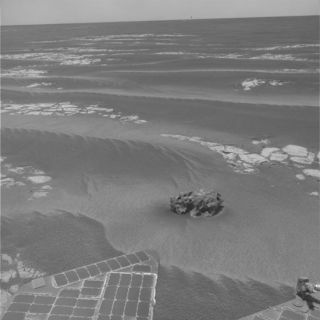 Opportunity and its twin rover Spirit ? which is currently embedded in a softspot of soil called Troy ? have been on the Martian surface for more thanfive years. Two Martian days after its backward drive, Opportunityturned around to face the meteorite. In the days that followed, it made a final3.3-foot (1-meter) moveto put the rock within reach of the rover robotic arm .Mission managers are now planning to use the arm to contact the meteorite andmake measurements. Opportunity has driven about 2,300 feet (700 meters) sinceit finished studying the meteorite called "Block Island" on Sept. 11,2009. Block Island weighs at least half a ton, is composed of ironand nickel, and islikely too large to have plunged through the current thin atmosphere ofMars without being obliterated upon impact, scientists say. Both meteorites have been found during Opportunity's trek toits next target, Endeavour Crater. Opportunity also found a third meteorite, Heat Shield Rock,in 2004.